Who would've thought that Motorhead's Lemmy would have a Wollongong connection? Granted, it is a tenuous connection, but it's a connection nonetheless. The story starts in Blackpool, UK in 1963 where a Merseybeat group by the name of Bruce & The Spiders played locally, supporting the likes of The Hollies at the local town hall, strip clubs, fire station... the usual places. 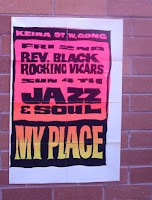 Also playing around the area was a band called The Reverend Black and the Rocking Vicars. It is likely the two bands played together on more than one occasion. Meanwhile, on the other side of the world, a band called Donnie & The Drifters were making a scene in Wollongong. Made up of Donnie Madden (vocals), John Neervordt (lead guitar), Sid Brassington (rhythm guitar), Derrick Brassington (drums) and Klasue Boch (bass), this band made it into the studio to record a demo of Cliff Richards' 'Move It' as well as a tune called 'Jeopardy', though the recording was never officially released. In '64, Boch was replaced by Bill Munt (formerly of The Impalas), and the band changed their name to The Finks. In '65 The Finks progressed through to the finals of Hoadley's Battle of the Sounds. Then in '66 Neervordt was replaced by Tony Kappen (The Seekers, The Living Dead), and Derrick Brassington was replaced by Dieter Glaser (The Sunseekers, The Four Moods). Like most local bands of the time, The Finks played regular shows at the Pioneer Hall, Zondrae's, and later on, Wonderland. In late '66 Munt was replaced by Laurie Hellyer (The Method) and the band entered the studio with local engineer Ossie Byrne in Tarrawanna. By this time, Bruce & The Spiders vocalist Dave Rossall had migrated to Australia and landed in Wollongong. Back in Blackpool, a spritely young Ian Willis had joined The Reverend Black & The Rocking Vicars. The band would later shorten their name to The Rockin' Vickers, and Willis would change his to Lemmy Kilmister. Upon arrival in Wollongong Rossall ventured down to Zondrae's and was soon introduced to The Finks. After joining the band he soon convinced the others to change the band name to Rev. Black & The Rockin' Vicars. Clearly plagiarism was far more easily achieved in a world pre-internet. Rossall's father, George, took over as band manager and soon the Vicars were in Studio 301 (Sydney) recording their first single 'Tears & Kisses' b/w 'What'cha Gonna Do About It' - the latter a cover previously performed by Doris Troy, The Hollies and Cilla Black. The single was released on ZOT in 1967, and credited as Rev Black & The Rockin' Vickers. Later that year Festival subsidiary Leedon re-released the single switching the A & B sides. Despite being solely credited to Rossall, local music historian Ged Fitszimmons claims 'Tears & Kisses' was initially composed by one Stanley J Gelber for Frankie Randall. 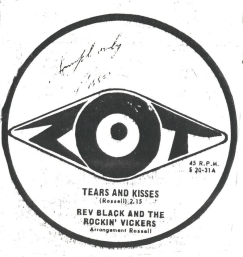 Fitszimmons alleges that in 1964, the original Reverend Black & The Rocking Vicars played on a UK beat music show along with a band called Peter & The Headlines, who performed their one and only single, a cover version of Frankie Randall's 'Tears & Kisses'. It is likely that Rossall had either seen this performance and/or got a copy of the single. Stealing another bands' name and plagiarising anothers' song weren't the only games of deception Rossall played. In an interview with Go Set he also falsely credited himself as being part of the original Rockin' Vicars in the UK. 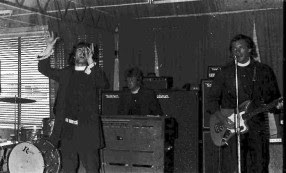 Both Brassington and Kappen left the band in '67. Hellyer changed to lead guitar, and the band recruited John Bellamy (bass) and Neil Willaimson (organ, previously of The Move in the UK) from Sydney-based Sebastian Hardie Blues Group. In January '68 however, Hellyer also opted out, making room for Kappen to return after an 8-month absence. Then, in February - just as the band were preparing to re-enter the studio - Bellamy also left the band citing artistic differences. Quickly, the Vicars recruited Wagga-native Greg Hill (aka Greg Gibbons) from Gus & The Nomads. 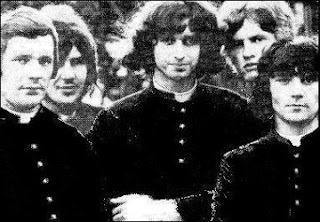 Emerging from Festival's studios in Pyrmont with 'Down to the Last 500' b/w 'Sugar Train', The Vicars were picked up by Ivan Dayman's label Sunshine Records. Dayman also took over the Vicars' management, and under his leadership the band toured extensively across the country. Later that year The Vicars entered Hoadley's Battle of the Sounds, and though were a crowd and peer favourite, the title was given to The Wanderers - a band "better suited to club work" according to Go-Set Magazine. Refusing to be defeated, The Vicars scored themselves a residency at Windang Hotel four nights a week, which brought amazing crowds. They also supported The Beach Boys at Wonderland and had Johnny Farnham support them at the same venue. Meanwhile 'Down to the Last 500' entered the Brisbane charts, peaking at number 30, and, according to Hellyer, reached number 13 in the Darwin charts. The band later recorded 'Such a Lovely Day' b/w 'Sorrowful Stoney', again released on Sunshine, but failing to chart. This single was credited as R. Black and the Rockin' V's. In 1969 the band recorded 'Walkin' & Talkin' b/w 'How Does It Feel', but this single failed to chart also. 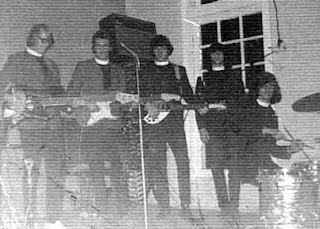 This lack of sucess would sound the deathknell for the Vicars, and the band parted ways in 1969, though not before Hellyer - who had been playing with The Cast - had rejoined, bringing fellow Cast member Stuart Bedford with him on lead guitar. The band played their final shows at Wonderland. The majority of the band would go on to form Tin Pan Alley together with Coopers Phil & Wayne from The Cast. A great deal of thanks goes to Dieter Glaser for his patience and persistence with this piece. Thanks also to Ged Fitzsimmons, and Terry Stacey's page whose attention to detail is second to none. Thanks for the info Warren, I remember much of that time, The Vicares was my favourite Wollongong band at the time and I saw them many times at the Windand Hotel, probably before I was legal age to get into a pub!! What memories. In the 60's we lived next door to Windang pub and although under age (just) I attended heaps of the vicars gigs. The crowds were enormous. Neil was very good on organ and could play classical stuff when asked by older patrons, but the energy from the band was amazing. They were without doubt the band of the times. As an aside, another band that were very good were "Freddy Hampton and the Roll Movement". What great days. I attended David's funeral and was so pleased to see so many musicians and fans from the 60's showing their respects. Sadly My husband Wayne King who was a well known bouncer of this era, passed away 7th August 2016, Wayne was 68 and we had been married for 49 years..